This blog was written for HMDT by Professor Kay Schiller, a historian of modern European culture and sport at Durham University. He has written extensively on German-Jewish history and the history of the Olympics and the FIFA World Cup. The Rio Games which are about to begin are a welcome occasion for media and historians to remind the public of the 1936 Summer Olympics in Berlin 80 years ago. February 2016 saw the release of the Hollywood biopic Race on Jesse Owens’ trials and tribulations about whether to boycott the Games and his triumph in Nazi Berlin which was immediately followed by his victimization by the American establishment on account of the colour of his skin. German television station ARD in turn recently broadcast the parallel-lives documentary The Dream of Olympia (Der Traum von Olympia). It tells the tragic history of these Olympics through the eyes of Wolfgang Fürstner, a nationalist German army officer who was in charge of the Berlin Olympic Village before being dismissed on the eve of the Games because of his part-Jewish descent which drove him to take his own life, and Gretel Bergmann, the Jewish-German record-breaking high jumper who might have taken the Olympic gold medal, had the Nazi regime not excluded her from the German Olympic team at the last minute. Bergmann survived the Holocaust by emigrating to the United States in 1937, where she still lives, now 104 years old. That such stories are re-emerging now and that they meet with a captive audience is one of the redeeming features of the history of these Games. For large stretches of time, in Germany at least, they had been wilfully forgotten. To many Germans of the post-war era, if the 1936 Games meant anything at all, they were one of the achievements of the Nazi regime – a triumph in fact, the first large-scale, no-expenses-spared and genuinely ‘modern’ games of Olympic history. For much of the rest of the world, they were ‘the greatest propaganda stunt in history’ (New York Times), pulling the wool over people’s eye about the Nazi regime’s true intentions. The dictatorship began its preparations for a genocidal war during the same year. From a historian’s perspective they were both, as politics and sport mutually benefitted from each other. The ‘Nazi Olympics’ legitimized a criminal regime, but at the same time the Olympic movement got a massive boost through those Games. Without them our enduring love affair with the Olympics until today may not have lasted. That stories such as that of Fürstner and Bergmann are being told in Germany is largely the merit of the work of local citizens’ initiatives. From the 1980s and 1990s onwards the Berlin Olympic Stadium and its surrounding grounds, which had been used for sport events almost uninterruptedly after 1936, became the focus of ‘memory work’ and demands for a critical engagement with the Nazi history of the site. Reflective of a changing attitude towards the past were street renamings with a Jesse-Owens-Allee in 1984 and, in 1997, a Flatowallee, named after Alfred Flatow and his cousin Gustav Felix Flatow, two Jewish-German gymnasts and 1896 Olympic medal winners murdered in Theresienstadt. Gretel Bergmann also received a street named in her honour in 2015 near the Olympic Stadium. The breakthrough for such initiatives came on occasion of the 2006 FIFA World Cup in Germany. After Berlin had unsuccessfully applied for the 2000 Olympics, the future of the stadium, then in a state of bad repair, became the subject of intense public discussions. Eventually the decision was made to comprehensively refurbish it, preserving its historical character while at the same time turning it into a multifunctional arena fit to host a World Cup Final. Lest the past not be forgotten, a museum space with a permanent historical exhibition on the 1936 Games was created and 45 plates with critical historical commentaries were erected on the grounds. As a result the former Olympic site was turned into a successful combination of sports and leisure space, museum and site of memory. That it is acknowledged in this way by many was obvious to me when I toured the area on a Saturday in August 2015. I saw tourists interested in the history of the site attending one of the regular tours of the Olympic Stadium, walk along the historical trail reading the plates and visiting the permanent exhibition. The continued importance of sports and leisure on the former Olympic site is not only demonstrated by the stadium itself as the home ground of the local Bundesliga club, Hertha BSC. On the same day I observed Turkish kids kicking a ball around on a meadow by the Olympic pool, swimmers and sun bathers enjoying the good weather, a hobby football tournament on one of the area’s pitches, Hertha BSC U19s playing their peers of Hannover 96 on another and members of the Indian and Pakistani community using yet another for a cricket tournament. 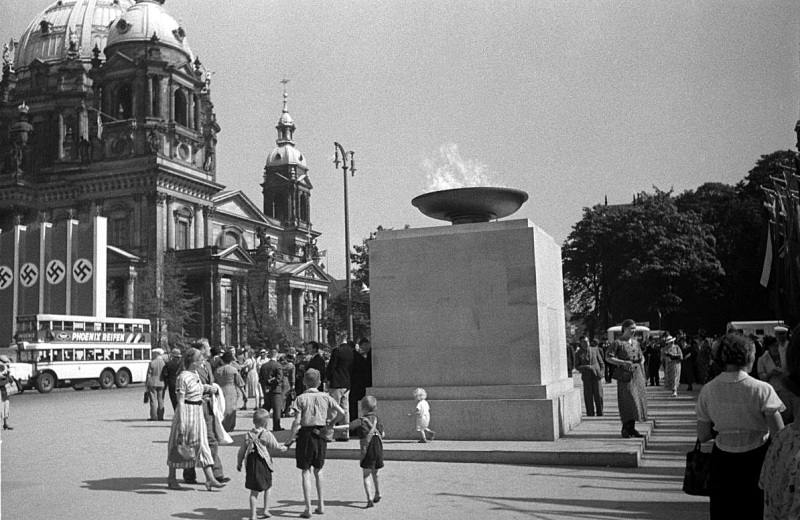 The successful synthesis of sports and leisure site, museum and memory site was perhaps expressed most movingly with the holding of the 14th European Maccabi Games, Europe’s biggest Jewish sports event, in Berlin in July and August 2015 on the former Olympic site, from which Jews had been excluded in 1936. The HMDT blog highlights topics relevant to our work in Holocaust and genocide education and commemoration. We hear from a variety of guest contributors who provide a range of personal perspectives on issues relevant to them, including those who have experienced state-sponsored persecution and genocide. The views expressed are those of the author and do not necessarily represent the views of HMDT.